Welding is a particularly energetic manufacturing process where a small volume of metal goes from room temperature to melting point and back in a matter of milliseconds. Once the weld metal reaches a molten state, it begins to flow and swirls around like the wind in a storm. Movement of molten metal is governed by gradients in surface tension. In pure metals and alloys, surface tension decreases as temperature increases. So for a welding process where the exposed surface of the molten metal is smooth and continuous, as is typical on TIG welding and conduction-mode laser welding and electron beam welding, the surface tension is lower at the center of the weld and higher at the edges. The surface tension gradient sets up movement of the liquid from center to the edges, from low to high surface tension. Such an action produces a wide and shallow weld. Mixing of metals in molten state is not completely homogenous, and impurity elements can segregate to the surface and lower the surface tension. But some impurity elements also change the effect of temperature on surface tension, causing surface tension to actually increase with temperature. High surface tension at the center of the weld pulls in liquid from the outer edges as the liquid in the center sinks producing a deeper and narrower weld. Surface tension driven fluid flow is commonly called Marangoni convection from the work of Carlo Marangoni. Fluid flow in melt pool can be controlled by controlling impurity element concentrations and has been well documented for stainless-steels containing sulfur, oxygen, selenium, and tellurium. For example, under identical welding conditions, the weld depth-to-width ratio in TIG welding of 304 SS can increase from 0.2 at <20 ppm sulfur to nearly 0.4 at 160 ppm of sulfur. These ratios will depend on many factors including power density which will be much higher for conduction mode laser beam and electron beam welding. Adding elements to the weld pool that bond with the surface active elements has the opposite effect on weld depth. For example, small amounts of aluminum in steel welds can react with oxygen and render it inactive, thus reducing surface tension and producing a shallower weld. Oxygen from shielding gas can also affect surface tension by bonding with some of the minority elements. It can get interesting when you are attempting to weld alloys from two heat lots which could have significant differences in minority element concentrations and produce a weld pool that is offset and deeper on one side. Make sure your torch/beam is properly aligned before you blame the off-balance weld on surface tension. Otherwise, you would just be raising a storm in a teacup. As opposed to the conduction mode welding referred to in the above discussion, keyhole welding is the result of high energy density sources such as plasma, laser, and electron beam that open up a keyhole-shaped cavity in molten metal. At high energy densities, vapor pressure above the molten metal increases substantially and pushes down on the liquid surface opening up a deep cylindrical cavity called the keyhole. The keyhole is a dynamic phenomenon with forces of vapor pressure trying to keep the keyhole open while surface tension of molten metal that forms the wall of the cylindrical cavity tries to close the keyhole. A keyhole can form during both pulsed and seam welding. In seam welding, the energy source travels along the weld interface and the keyhole comes along for the ride. 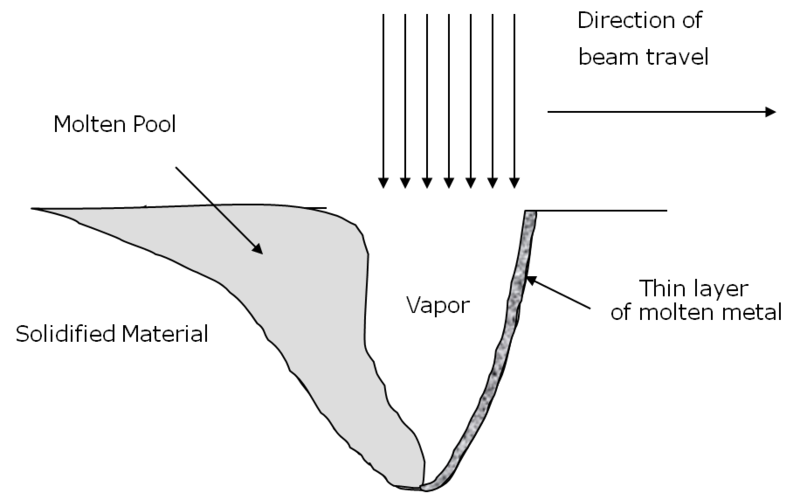 Similar to fluid flow due to surface tension gradients discussed in the article above, molten metal flows from the front (direction of beam travel) edge of the keyhole to the back as fresh metal melts under the influence of weld energy. The delicate balance between vapor pressure and surface tension is maintained under steady-state conditions and the keyhole moves forward along the weld seam. Keyhole formed during seam welding is not always stable and can close up due to molten metal falling back into the keyhole; this process often traps high pressure vapor that does not have a means to escape and appears as weld porosity. As the keyhole closes, the intense energy source produces conditions to open it up again and the cycle continues. Such stops and starts can occur in a fraction of a second and may not be obvious unless viewed with a high-speed camera. The main advantage of keyhole welding over conduction mode welding is its ability to form a deep and narrow weld, thus reducing the overall volume of the weldment for a given weld depth. Limitations include need for better weld fitup, better alignment between energy beam and weld seam, and for parts to have certain minimum thickness. While keyhole welding allows for higher linear welding speeds, it does tend to generate greater amount of spatter compared to conduction mode welding. Polishing weld samples is tricky business. We use sandpaper to polish, but isn't sandpaper supposed to scratch the surface? Try sanding a piece of glass and the scratches will be obvious. The trick is to start with coarse grit sand paper to first get the sample surface flat - you should see uniform scratch texture all over the required area; 80 or 120 grit size should work well. Once you have a flat area of interest (which is very important), you can start polishing with 180 grit paper, and then 240, 320, 400, and so on. The goal of the next grit size is to remove the big scratches formed by the previous coarse grit but it also makes new finer scratches on the surface. If you skip a grit size and go directly from say 240 to 400, it will take you a lot longer to get rid of all the big scratches. If you skip two sizes, you may never be able to polish off the big scratches. So if you are seeing scratches on the surface of your polished samples, it is quite likely that you have skipped a grit size or two during the polishing process.